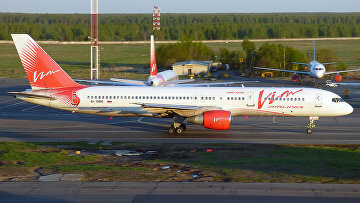 Bankruptcy proceedings against VIM Airlines extended for 6 months | Russian Legal Information Agency (RAPSI). MOSCOW, January 28 (RAPSI) - The Commercial Court of Tatarstan has extended bankruptcy proceedings against VIM Airlines for six months, RAPSI has learnt in the court. The republican commercial court has scheduled hearing of a bankruptcy receiver’s report on the results of the bankruptcy procedure for July 19. On September 26, the court declared VIM Airlines bankrupt. The bankruptcy claim has been filed against the air carrier by the company RNGO. In August, the court granted an application filed by the company, including a 3 billion-ruble ($44 million) debt into the creditors’ demands list. On October 17, 2017, a criminal case was launched over premeditated bankruptcy of VIM Airlines. In September of the same year the court returned a bankruptcy claim against the airline back to the Deposit Insurance Agency (DIA). According to the court, due to the social tensions surrounding the activities of the airline, the applicant decided to recall the motion. Investigators believe that certain top managers and owners of the air carrier intentionally made losing bargains in 2016 and 2017 including those aimed at siphoning of assets abroad. The deals led to enormous financial outlay and undoubtedly resulted in the company’s failure to pay debts to creditors in full. According to investigators, employees of VIM Airlines continued to sell tickets to clients despite being aware that the airline was not able to transfer passengers because there were not enough funds to buy fuel. Investigators believe that the employees embezzled more than one million rubles ($17,000). VIM Airlines CEO and chief accountant Alexander Kochnev and Yekaterina Panteleyeva have been arrested as part of the case. Co-owners of VIM Airlines Rashid Mursekayev and Svetlana Mursekayeva fled Russia and are currently residing abroad, according to investigators. Allegedly Mursekayev and Kalashnikova fled Russia to hide from investigative authorities. In December, the Basmanny District Court of Moscow issued an arrest warrant for Mursekayev in absentia. Investigators also believe that between 2015 and 2017 the defendants abused their office positions to buy overpriced aviation fuel from companies controlled by Mursekayev. Allegedly, VIM Avia’s damages reach 782 million rubles (nearly $12 million).